The Brunswick House, view gazing east along Bloor Street from west of Brunswick Avenue. The Brunswick House, a well-known icon of the Toronto pub scene for 140 years, closed on April 1, 2016. It was slated to shutter its doors the previous day, but due to the enormous crowds attracted by its closing, it remained open for an extra day. Its demise will be mourned by many university students, locals, and others attracted to this unconventional, lively pub. Located at 481 Bloor Street West, it was on the southeast corner of Brunswick Avenue and Bloor Street West. The Brunswick Hotel was established in 1876, to the northwest of the city, its proprietor Benjamin Hinchcliffe. 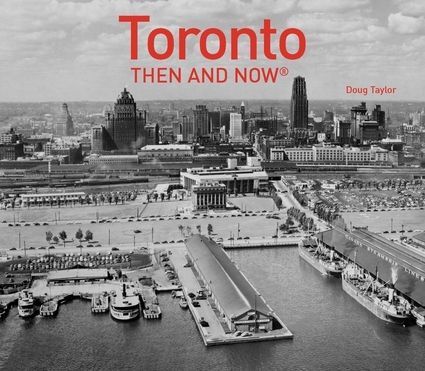 When it opened, horse-drawn streetcars had not yet appeared in the district, since on Bloor Street, between Yonge and Bathurst Street, there remained many open fields and empty building lots. To the west of Dufferin Street was mostly farmland, so the Bloor and Brunswick area was viewed as rather remote. Thus, the hotel’s patrons were mainly those who resided in the area or travellers who needed local accommodations. The building was architecturally typical of buildings constructed during the final decades of the 19th century. However, the three-storey red-brick structure would have been impressive in its day, its heavy cornice displaying a degree of extravagance that was unusual in the working-class district where it was located. Above the cornice was an elaborate parapet that gave the appearance of added height. The large rectangular windows allowed much daylight to enter the interior in an era that lacked electric lighting. In 1900, the hotel remained under the proprietorship of Benjamin Hinchcliffe and was known as a saloon for immigrants and workmen of the district. Hinchcliffe resided at 207 Borden Street, near the corner of Borden and Sussex Streets, not far from his place of business. In 1902, W. J. Davidson became the manager of the hotel, and in 1912 Joseph McLachlan assumed control. In 1920, Mrs. Catherine (Kate) Davidson became the proprietor, commencing a long period under her management. During her days at the hotel, it was penalized several times for serving beer that possessed too high an alcoholic content. In 1942, Mrs. Davidson changed its name to the Ye Olde Brunswick Hotel. In 1961, the hotel was purchased by Morris and Albert Nightingale, two brothers who increased business at the establishment by hosting unusual events such as pickle-eating contests and a Mrs. Brunswick contest for older woman. The promotional stunts attracted many customers and sometimes the police, who were called when the crowds became rowdy. A large room on the second floor, the Albert Hall, became famous as a jazz venue in the 1980s. It is not clear when the hotel’s name was changed from Ye Olde Brunswick Hotel to the Brunswick House, but it continued to attract people of various lifestyles, and on one occasion a wedding was performed within it. In 2005, the hotel’s interior and exterior were extensively renovated. When it closed in April 2016, the long rows of wooden tables in the pub area on the first floor, the pool table, games, and the stage for dancing, all fell silent. Abbis Mahmoud was the manager at the time of its closing. It appears that a Rexall Drug Store will occupy the large space on the ground floor, although this has not been confirmed. Note: Below is additional information provided by Dorothy Willis in an email after the post on the Brunswick House was published on this blog. I read with interest your article on Toronto’s Brunswick House on your website Historic Toronto (May 2016). It is sad to note the loss of this historical building. It was designated a Heritage Property in 1991 but will this make any difference to its future? Benjamin Hinchcliffe (1831 – 1911) was my great great grandfather. After arriving in Toronto in 1865 from Silkstone England, his first hotel was the St. Georges at the corner of Yonge and Richmond (Mitchell’s Directory 1866), followed by the Osgoode House at Queen and York Streets from 1870 until he became innkeeper of the hotel at the corner of Brunswick and Bloor (various city directories). Benjamin received his tavern licence in 1876 from the License Commissioners (Daily Globe May 8, 1876). That same year, according to the Assessment Roll for the Ward of St. Patrick, City of Toronto, he was the owner and occupier of the tavern. There was also a driving shed and ballroom on the property. I have been writing a book on my Hinchcliffe family. I appreciated your photos and descriptions of the Brunswick in your article since I had never been inside. May I quote your descriptions in my book? Also I did not realize that Benjamin still owned the Brunswick until his death in 1911, “in 1912 Joseph McLachan assumed control.” I had not researched the hotel once I thought he had branched into real estate so thank you for that info. I have attached an undated photo of Benjamin and copies of his obit and probate of his will. He did not trust banks so put his money into property. I wanted to let you see the man behind the Brunswick. Thank you for bringing the history of the Brunswick Inn to the readers of Toronto. Location of the Brunswick House on Bloor Street West. The north facade (left-hand side) on Bloor Street, and west facade on Brunswick Avenue on April 2, 2016. The hotel’s west facade on Brunswick Avenue, April 2016. The cornice on the Brunswick House in 2016. The dentil-like modillions (brackets) are beneath the large cornice that extends out over the street. Entrance to the Brunswick House. The pub area on April 2, 2016, the day after the Brunswick House closed. The foyer inside the main door that led to the pub. Interior of the pub, the day after the Brunswick House permanently closed. Staircase that led to the second floor, where the Albert Hall was once located. The space on the second floor remained open on the day after the Brunswick House permanently closed. This space was once the jazz venue known as the Albert Hall. The west facade of the Brunswick House, facing Brunswick Avenue. Photo taken April 2, 2016.